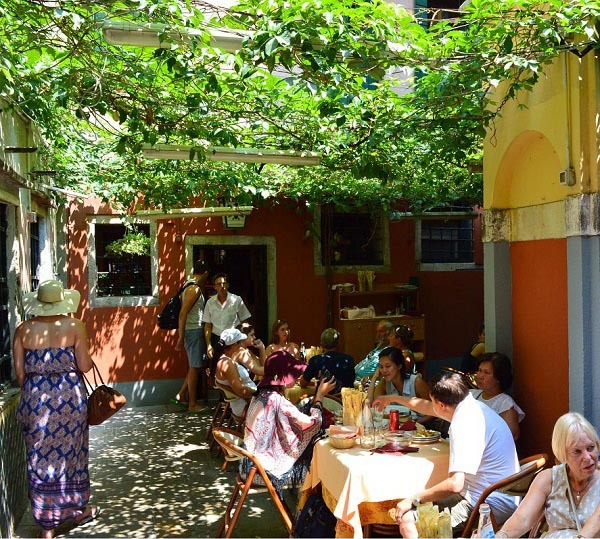 Castello is a very good choice when it comes to looking for somewhere to stay in Venice. First choice must be The Venice Metropole Hotel. Fabulous indeed if you want superb service, superior accommodation and a location that would be very difficult to beat. The Metropole is a little expensive though so if you'd prefer something a little more affordable try these hotels. Castello is the area to the left of St. Mark's Square as you stand looking out at the water. It varies considerably in character, getting more touristy and more affluent the nearer you get to Saint Marks Square. Going the other way, the further you go east, the more rundown and working class the area appears. 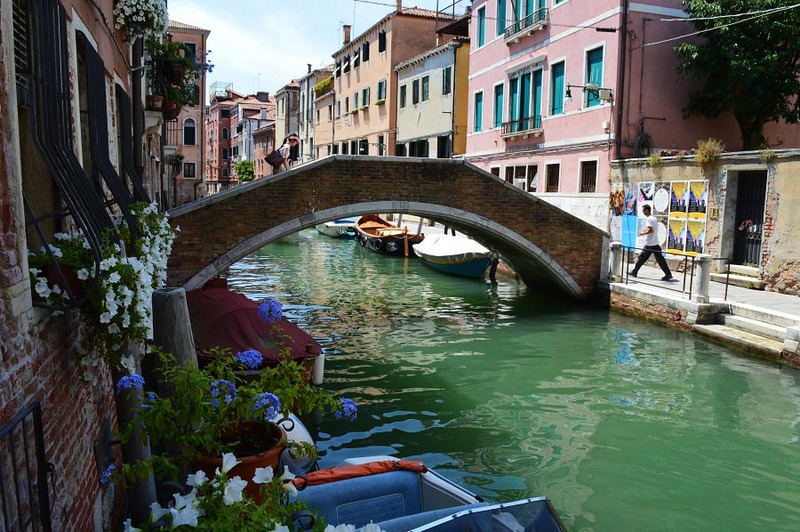 If you get lost visit our maps of Venice Italy page. The eastern waterfront offers lovely views across to San Giorgio. The best time to visit the waterfront is early morning when there are less people about. Castello is famous for its Arsenal (Arsenale). This is the original armoury and naval dockyard. My English father-in-law, an Arsenal supporter (football/soccer team) tells me that the word originates here – I don’t know how true that is though. Castello has lovely parks too, my parks section mentions a few of these. 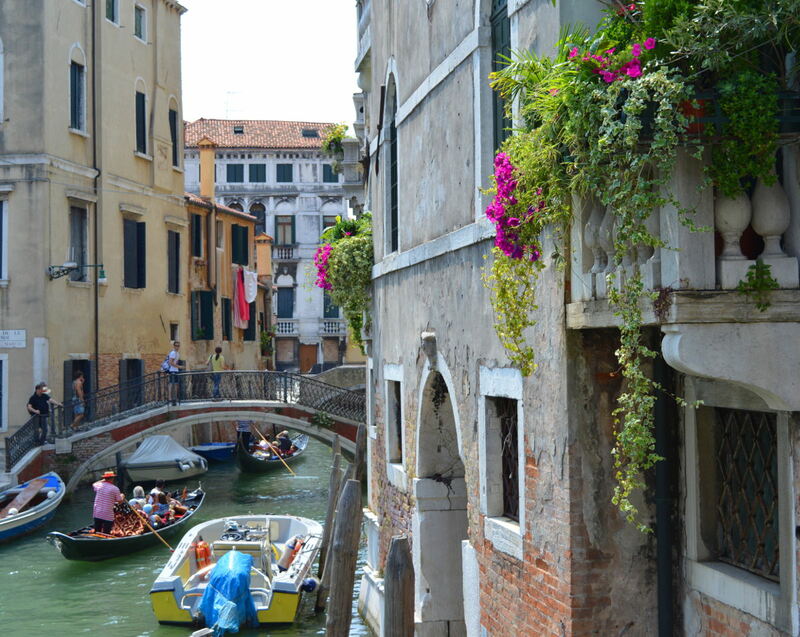 Take a stroll up Via Garibaldi, which is one of the few wide avenues that Venice has. There is nothing particularly fantastic along here but it is a pleasant street, with shops selling stuff people need rather than only tacky souvenirs. Eastern Castello was home to the one of Europe’s most important Greek communities. According to expert Greek sources, a Greek restaurant owner friend, this community was instrumental in the Byzantine architectural style to be found throughout Venice and had a major influence on Venetian intellectual life. 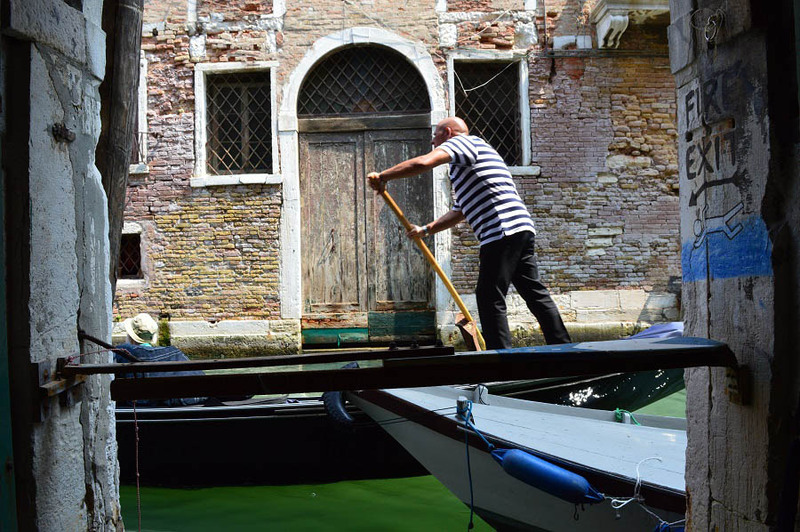 Many of the Greeks who moved to Venice came from the Dalmation coast of Yugoslavia (once a Greek colony) and they were given the name Schiavoni. You will find many places named after them – most famous perhaps being the Riva degli Schiavoni. Centre point of the Greek community was San Giorgio dei Greci. This 16th century church includes some superb mosaics and a 14th century Byzantine Icon, Blessing Christ, which is of major significance. The church is the most important Greek church to be found outside of Greece or Turkey. The ancient school of the Greek Dalmation community, the building contains a series of nine masterpieces by Vittore Carpaccio featuring Saint George, Saint Jerome and Saint Augustine. Together with Santa Maria Gloriosa dei Frari this is the second of the two Franciscan churches to be found in Venice. It is a lovely 16th century church, in simple Franciscan style, but personally I prefer Santa Maria Gloriosa dei Frari. The church houses some beautiful artwork by Battista Franco and Francesco Fontebasso. My personal favourite is the touching painting of the Madonna and child by Antonio da Negroponte. Near the Arsenale, this museum should be visited by anyone who wants to understand fully the history of Venice Italy. For Venice as a trading city, built on water, ship building was vital and this museum provides an interesting insight. Entrance is only 3 Euros and the Gondola display is the best part. A big church built in the 15th century. Very big and very impressive. This is the square in which the church previously mentioned is to be found. Second only to Piazza San Marco, it is a lively and pleasant place and the atmosphere is different to St. Marks – less commercialized perhaps. The 15th century Scuola Grande that faces onto the square has one of the loveliest facades in all of Venice and that is indeed something when you consider the competition. Time to enter another world! 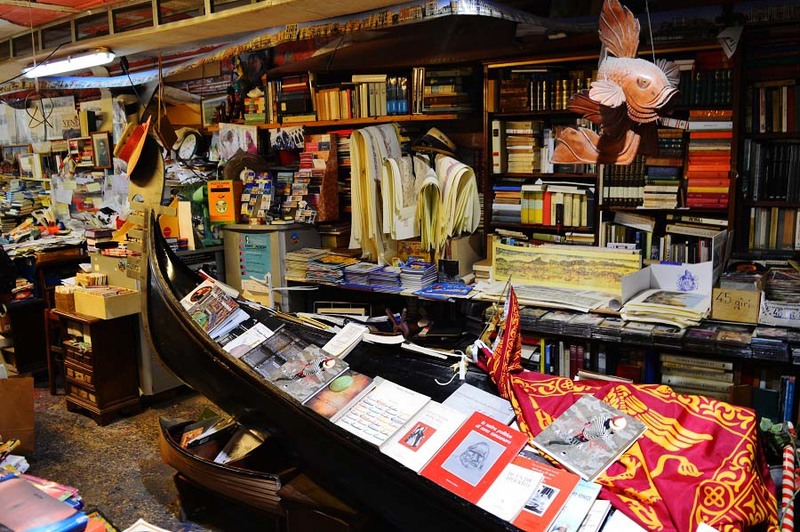 The moment you walk through the door, into this fantastical bookstore, that is where you'll find yourself. One of the must-see sights of Castello. Read more about it here. Situated in a busy and rather pleasant piazza (campo) this 15th century church is nice enough but nothing special. A number of other sights are worth seeing while you are in Castello. These include San Zaccaria which has some great artworks by Bellini and the La Pieta church on the Riva degli Schiavoni, the church where Vivaldi was once choir master.